You guys! It’s fall!! I’m in heaven, and totally soaking it up. Other than a weird few days of summer weather last week, the air is crisper, the leaves are starting to change colors, and all I can think of is baking all things pumpkin. During the fall season, I always have occasion to give a few gifts–to friends, ladies from my church that I visit each month, neighbors, teachers, and hostess gifts. 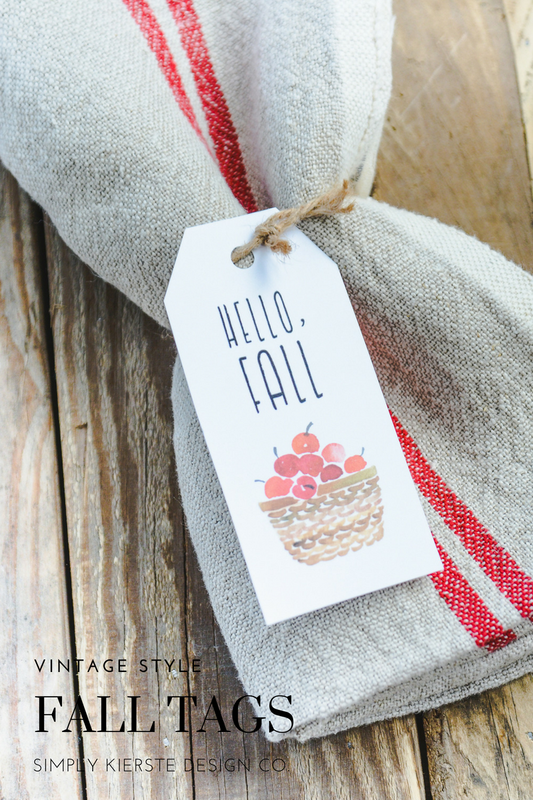 I like to have a few fun fall tags on hand to tie on to a yummy treat or small gift, and I’ve created these darling “Hello, Fall” tags that I absolutely love! I used a basket of apples on the tag because they are one of my very favorite fall things, and I think they represent the feeling of fall so well. The darling red grain stripe dishtowel came from the cutest boutique in the Adirondack Mountains of upstate New York that I found this summer, and I fell in love with it immediately. I just had to get it! Giving dishtowels as a hostess gift is one of my favorite go-to ideas, and they’re perfect anytime, but I especially love giving them during the fall and holiday months. Going to someone’s house for Thanksgiving? Or fall party? 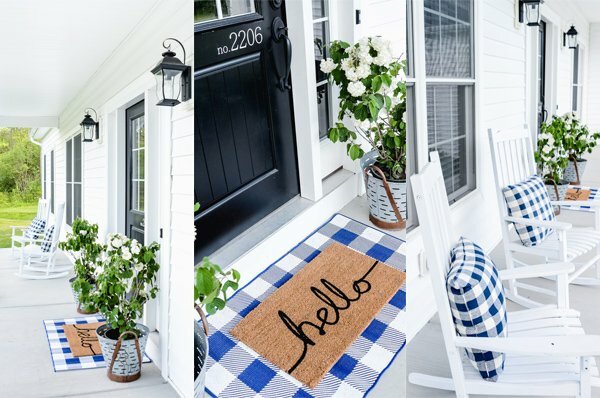 This is a simple and adorable idea that will be appreciated by any hostess. Milk bottles filled with candy is also one of my favorite go-to gifts, and perfect for neighbors, teachers, and friends. I visit a few ladies from my church each month, and I like taking a little something with me when I go. Tie the tag on to a loaf of bread, any kind of apple or fall treat, wooden spoons, homemade jam, or anything you like! To create the fall tags, just print the file (download below) on to white cardstock, then cut to size. I like angling the top two edges to make it look like a shipping tag! Punch a hole in the top, then use jute, twine, or ribbon to tie it on to your gift. I know you’ll think it’s silly, but I’ve been looking for dishtowels like these for a long time, and can’t find any. All I can find are the decorative ones, thicker. I just want the plain old-fashioned towels like these that absorb quickly and dry quickly. They remind me of when I was a little girl helping my mom with the dishes. Where can I find these?